The air is becoming crisper and the sun is setting earlier. Follow the to-do’s below to help you maintain your biggest investment and to prepare for those cold winter days. Make note. Take a walk around your property, to look for signs of damage to the roof, siding and foundation. If you spot anything that needs repair, schedule it before winter weather hits. Clean up the yard. Rake up the leaves and debris. Make sure that overgrowth does not block the windows or path to the entrance. Cutting bushes and tree limbs will let the sun inside and showcase the exterior of your home. Clean the windows. Rain and wind from over the summer months can make your windows dirty and streaked. Schedule furnace maintenance. When was the last time you changed your furnace filter? Have the HVAC system checked before you need to turn on the heat. Clean out the fireplace. Have your chimney cleaned by a professional. Clean the gutters. After leaves have fallen, clean out the gutters and downspouts. Caulk windows. Be sure to caulk around windows and doorframes to prevent heat from escaping. Inspect the roof. Make sure the roof is in good shape. Inspect for missing and loose shingles. Your roof protects your home, make the repairs when they happen so you don’t find yourself in a predicament. Reverse the ceiling fans. Change the direction of your ceiling fan to create an upward draft that redistributes warm air from the ceiling. Cover air conditioner. Remove units from windows or wrap the outside box with a tarp. Clean off your porch and deck. Look for any needed repairs and cover or store outdoor furniture in a protected area. Make sure all soil is emptied from pots and planters. Improve Insulation. This will help prevent cold air from seeping into your interior. Investing in insulation will save you money on your energy bills because your furnace will not have to work overtime to heat your home. Clean the clothes dryer exhaust duct. Remove lint and dust that may have accumulated. Shut off exterior faucets. Protect your pipes from freezing temperatures by shutting off water to exterior faucets and drain hoses and store them. Winterize the sprinkler system. Check safety devices. Replace batteries in smoke detectors and carbon monoxide detectors. Check the expiration date on your fire extinguisher and replace if needed. If you haven’t checked your home for radon, fall is a good time to do so. Please call us if you need anything. We really appreciate you and your business! No one wants to pay more taxes than necessary. In fact, there is a quote I ran across from Judge Learned Hand (philosopher and US Court Judge) that says “Anyone may arrange his affairs so that his taxes shall be as low as possible…..for nobody owes any public duty to pay more than the law demands.” Although Judge Hand was referring to income taxes, the concept can reasonably be expanded to all taxes. There are several areas where real estate and taxes overlap. One area is property taxes — the taxes paid to local governments based on the assessed value of the property. In Colorado, property is generally reassessed every two years. Notices are sent out with the revised values and the timeframes for appeals. The appeal process is pretty straightforward — owners may submit alternative comparable properties to support a revised (hopefully lower) value. Counties use an automated system for identifying comparable properties that does not always come up with the most similar properties. This is particularly true of properties not in big subdivisions. If you can find 3 properties that support a lower valuation, you may be able to save some money on your property taxes for a couple of years. We have had many clients that have successfully appealed their valuation. Another area where real estate and taxes come together is on properties that have been sold through a short sale or foreclosure proceedings. A previous post on this issue has the details but the bottom line is act this year if this situation may be something you are facing. Right now there is no tax on any debt forgiven but this exemption expires the end of 2012 (unless Congress takes further action). The sale of investment property can result in a taxable gain. It is possible to defer the taxes if the money is reinvested in similar property through a section 1031 exchange. There are rules about the timing of the exchange (days until the new property is identified, days to close, etc) and how the proceeds can be held until the “new” investment is made but it is a well established process and there escrow companies that specialize in assisting with these types of transactions. Warren Buffett, the “Oracle of Omaha”, is bullish on the housing market. In several recent interviews, Buffett commented that real estate has significant upside in the future. Buffett’s opinion is based on several factors including the historically low interest rates for purchasers. Buffett believes that housing as well as stocks what he considers “productive assets” compared to treasuries and gold. He also believes they have greater upside potential that gold. He commented that if he could figure out a practical way to do it, he’d “buy up a couple hundred thousand” single family homes. Another factor he cited was the forecasted increase in households as the economy improves. During the recession, people moved in with parents, in-laws or others to save costs. As the economy improves, many of these people will strike out on their own. The estimate for household formation is 1.14 million compared to about 609,000 new housing starts. The imbalance will create demand for existing homes and help absorb the excess inventory of resale homes. There is not an excess of homes in all areas. 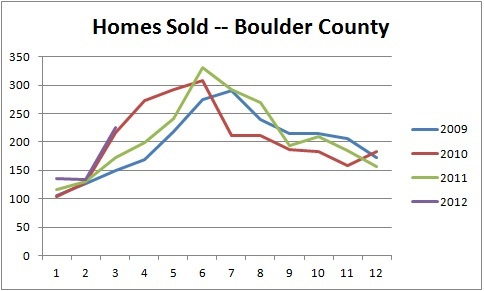 In Boulder County, our inventory is well below prior years in most areas. This trend is also true in the greater Denver area. In the Boulder area, some cities like Louisville have about half the “normal” inventory and homes are selling before they are in the MLS. We have actually seem a few competing offers the last couple months! 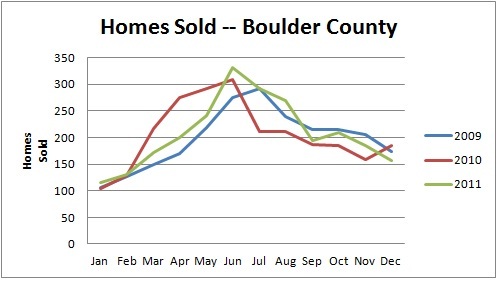 The first quarter statistics for Boulder County show stable prices and numbers of homes sold on par or better than the last several years. The one area that is still lagging is the mountains. For the details on the individual areas in Boulder County, visit the statistics page on our website. In our current real estate market, buyers and sellers are sometimes using less traditional methods to buy and sell homes. It is possible to buy or sell a home at an auction. Sellers can use an auctioneer to sell their homes — even eBay has a way to sell a home! Lets examine when an auction might be a good idea for a seller…. Auctions can be a legitimate tool for certain sellers. Auctions can result in the sale of a property faster than a “normal sale” — there is a defined marketing period, the auction and then a fixed number of days to close. A property could be marketed for 30 days, have the auction held, and then close in 30 days. An auctioned property could close in 60 days. The average days on market for listed homes in many areas is much higher. There are a couple other advantages to an auction that make it a speedier process — properties as sold “as-is” and are not conditional on financing. Buyers cannot cancel the contract because they cannot get a loan or they find out the homes needs a new roof — the buyers generally will lose their deposit should they back out prior to closing. Sellers are generally responsible for the cost of marketing a property to be auctioned. An auction relies on having lots of potential buyers that want to bid in order to get the maximum price so exposure of the property is key. The property should be advertised through as many mans as possible — print, direct mail, online, and signs. An auction company may help with this aspect but this is generally a charge to the seller upfront. Generally if a property is listed by a real estate broker, the broker covers the cost of advertising. An additional advantage to marketing for an auction is that “showings” would be very limited — perhaps to a 1 or 2 day preview so there would not be a long period of keeping the home tidy and dealing with numerous showing appointments. The cost for the auction itself is usually a buyer cost paid as a premium to the purchase price. This is different from most real estate commissions that are normally paid by the seller. Sellers can set a reserve price for the property. This is the minimum acceptable bid for the property. This amount should be sufficient to payoff all the liens on the property so a clear title can be delivered to the buyer plus cover any other required fees for transfer of the property. If the liens on the property exceed the market value, an auction will not be possible unless the seller has additional funds to payoff the existing liens. Buyers are also considering auctions as a means of buying homes. Can you get a bargain?? Probably not but you might find a reasonable deal. Buyers considering buying at an auction need to consider two big issues — you must have the money ready to go and the properties are sold “as-is”. So what might be an advantage to the seller is a disadvantage to a buyer. Properties can be either a foreclosure auction or the type of auction described above. Financing a property obtained through auction can be tricky — banks will generally not give you a mortgage for an auction purchase. Mortgages are hard enough to get for a “normal” purchase. It is possible to get hard money loans from investors or other sources but the interest rate is usually much higher that a purchase loan — somewhere between 12 and 18 percent!! If you do not have a large down payment, financing the property may be almost impossible. The financing need to be arranged before the auction — some states require payment within days on foreclosures. The condition of the home can also be a major consideration. Homes sold at foreclosure auctions may not be available for inspection — you might not be able to inspect the interior of the home at all. If the seller is auctioning the home, there would probably be an opportunity to at least view the inside. The normal inspection that most buyers do that would involve a more detailed look at plumbing, heating, roof, etc is not possible on many properties being auctioned. One further caveat on foreclosure auctions — NEVER buy a lien that is not in first position or you might lose all your money. The first lien could foreclose and all the subordinate liens would be wiped out! Foreclosure sale homes come with all existing liens — tax liens, mechanics liens, etc. It is a good idea to get a title report prior to bidding. Many people are unaware of the potential tax consequences of a short sale (or foreclosure). A short sale involves selling a property for less than the amount owed to the lien holder. The tax code considers a short sale a “Debt Cancellation”. When a lender cancels or forgives a debt, the difference between what the lender was owed and the amount they received to cancel or forgive the debt may be taxable. For example, assume you owe $250,000 on a mortgage and subsequently sell the property via a short sale for $200,000 and receive forgiveness for the $50,000 difference — this amount could be taxable income. Loan modifications — renegotiating a loan — that result in a reduction in the loan balance may also be taxable. Effectively, a reduction in the balance of the loan may be taxable as forgiven indebtedness. Foreclosures may also result reportable income. Luckily, the Mortgage Debt Relief Act of 2007 allows many homeowners to exclude the forgiven debt in many circumstances. Several conditions must be met for the forgiven debt to be excluded form income. First, the indebtedness must have applied to a qualified principal residence. Second, the indebtedness must had been secured by the residence. The amount excluded from income is limited to $2 million for married taxpayers or $1 million for single taxpayers. Finally and perhaps most important, the debt must be forgiven in calendar years 2007 through 2012. For homeowners considering short selling their home, the tax consequences may be significant. If the amount of forgiven debt is $100,000, there may be no tax consequences if the closing occurs this year (2012). If it closes in 2013, the $100,000 may be taxable and depending on an the marginal tax rate, could result in tens of thousands in taxes due. With 2011 behind us, we can look back and assess the ups and downs. It’s also a good time to remember that real estate is a VERY local market. 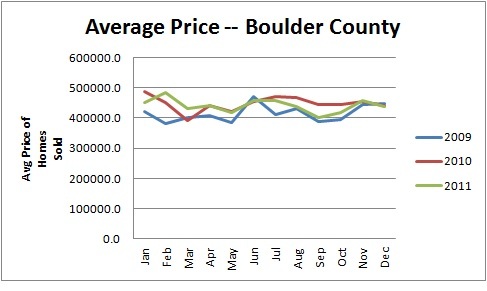 The national headlines about prices, units sold , permits pulled, etc seldom match the Boulder area facts. In our area, we see differences in mountain and plains properties compared to Boulder, Louisville, Superior and some of the other “towns”. 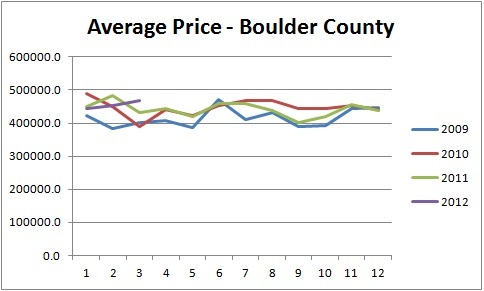 Even within a city — like Boulder — we can see differences in sales in areas or price ranges. Overall prices in the county have stabilized and the number of units sold is up very slightly in 2011 compared to 2010 and 2009. The inventory — the number of homes on the market — is low and in some areas, like Louisville, the lowest it has been in years. The average price of homes sold has been fairly stable over the year — a few up and downs — but fairly stable.